Norolle Poll Hereford Stud was founded in 1950 using polled females from Glenview and Merawah; and horned females from Karena. The property name ‘Norolle’ became the stud prefix. It was derived from Clyde’s parents names - Norman and Olive (Ollie) who together with their three sons built up the Norolle herd. Norolle rhymes with quality - if you want to know how to pronounce the name. In past years Norolle sometimes registered the highest number of calves in Australia and was often in the top five at any given time. Quality sires of great breeding value were introduced over many years from leading Australian studs and included Springfield Major and Kildrummie Chamberlain. The closed female herd became one of the most admired in the country. Outstanding overseas sires were then introduced with great success. These included BW 107 Chips 455M (USA) and several from the Canadian Remitall herd of Louis Latimer - Leonard 38L, live import Stetson 179S, Teamster 9T, live import Ace 145A, Boomer 46B and Embracer 8E. Woolford P193 Nick, Onondaga Cowboy’s Dream 238Y, MM RSM Stockmaster, GHC High Tech, Nuff Said, LLL Timber, Vaquero and of late, US sire KJ Victor 417L, along with Australian sires, including outstanding homebred ones and those from other leading Australian studs, have all been utilised within the herd. A long standing family partnership was dissolved in 1994 and Clyde continued to operate with his third of the Norolle herd at that time. These breeders were dispersed in 1998. The prefix used after the dispersal was Johnsons - previously registered by Clyde and Alison’s children - Julie, Kirrily and Greg. 200 embryos collected from six of the original Norolle donor dams allowed us to rebuild the herd, albeit at great expense, and new male genetics from purchased sires enhanced the breeding program. The Board of the Australian Poll Hereford Society, early in 2000, granted us the right to once again use the Norolle prefix. 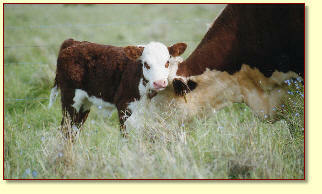 Calves born since 2000 are registered under the Norolle prefix. ‘On Property’ Sales were held from 1975 up to and including 2001. In early 2002 the stud was relocated from Roma to Millmerran. Norolle continued to enjoy success in the show ring with many Champions and Grand Champions. After the final Norolle Sale in 2001, the Norolle bulls were marketed very successfully - privately, and at the Roma Invitation Poll Hereford Sale, where they often topped the Sale average; and at the Dubbo National Sale. In July 2008, the complete herd of Norolle stud females were sold to Paul and Jenny Hancock, Whim Park Poll Hereford Stud, Blayney NSW. Norolle Cattle Company has Life Membership of Herefords Australia and will continue to take an interest in the Hereford breed.